Foster’s Rule Is A Rule In Evolutionary Biology That Explains? The Concept Of Video Game "Mana" Has Its Origins In Which Culture? If you look closely at isolated islands and the current inhabitants (and fossil record) therein, a curious trend emerges. Creatures that migrate to the islands and live in isolation tend to end up either growing very large or very small, but few remain the original size of their mainland counterparts. This phenomenon is called Foster’s rule after the 20th century biologist who first proposed it after extensive observation of size trends in island-dwelling animals. Foster noted that two things seemed to occur when a creature migrated to an island. Either the creature experienced insular giantism (it began growing larger on the island) or insular dwarfism (it began growing smaller). Typically, but not always, the trend aligns with whether the animal was a predator or prey. Foster’s explanation for this was simple and has held up over time: small prey animals could grow larger in the absence of abundant mainland predators and with plenty to eat on the island, whereas predators that experienced increased competition on the island became smaller, requiring fewer resources. 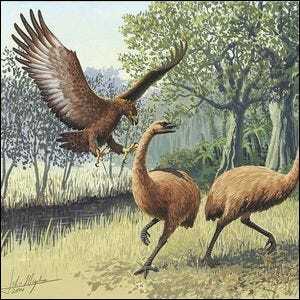 The painting here depicts two examples of (now extinct) giant adaptations, the Giant Haast eagle and the flightless Moa, both ancient species found in New Zealand.